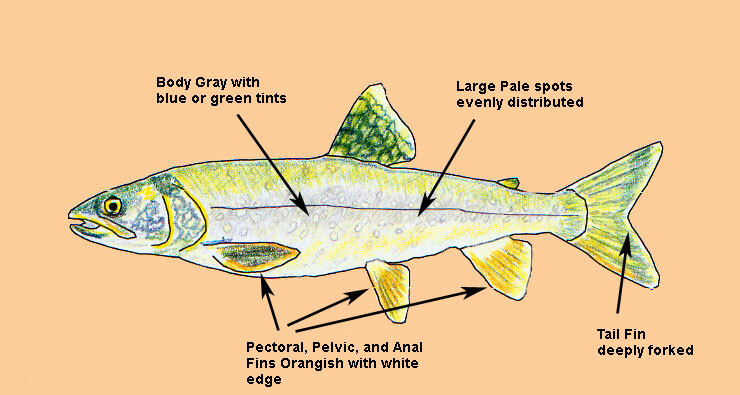 The Lake trout (Salvelinus namaycush), belongs to the char family. Most of these fish are found within the Lake Tahoe, Donner Lake and Fallen Leaf Lake around the Truckee River Drainage areas. This fish is generally deeply trolled for with minnow-type lures and can grow to over 15 lbs. It feeds on other fish and has been blamed for the disappearance of Lahonton Cutthroats from Lake Tahoe. The Lake Trout was introduced to California from Michigan in 1894 but has not been widely distributed due to its competition with other species. The body is a dark gray but can vary from pale to almost black. The entire body is covered with large pale spots except the belly. There are dark wavy lines on the fins that the caudal fin is deeply forked. Generally the body is slender.